Articles: ICICI Private Banking Program for Banking & Finance Industry Program for Everyone !!! ONE of its kind, to make ONE of a kind! International Management Institute (IMI), New Delhi one of the top B-schools having gold standard benchmark and ICICIdirect Centre for Financial Learning an educational initiative of ICICI Securities announce the launch of Post Graduate Certificate Programme in Private Banking (PGCP-PB). About the Programme: This programme will provide participants a unique opportunity to interact with seasoned experts and leading practitioners in the industry, while exposing them to competing approaches and strategies in the new challenging environment. Eligibility: Graduates / Post Graduates in any discipline with or without experience. Programme Curriculum: The course aims to comprehensively cover all aspects of private banking through different topics across the areas related to their role. 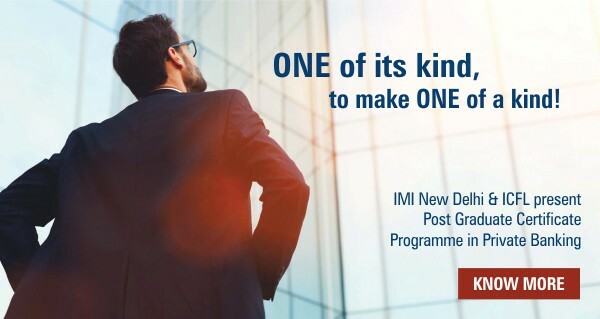 Certification: On successful completion of the program a student would be awarded “Post Graduate Certificate Program in Private Banking” offered by the IMI, New Delhi in association with the ICFL as a Strategic Partner.